The BMW M4 Coupe is the bad boy car your parents never wanted you to drive. Devastatingly fast in a straight line, it’s great fun to drive and comes paired up with an awesome automatic transmission. Unfortunately, some of its raw power has been diluted by the addition of turbochargers. But it still operates on the same simple formula it did back in 1985: Engine at the front, transmission in the centre, and driven wheels in the rear. It’s a powerful concoction that helps the car launch itself from 0-62 in 4.1 seconds. That’s as quick as the Porsche 911 – but this is £30,000 cheaper. A sports exhaust and 20” alloys can be added if you want to turn it into the ultimate warrior. Join OSV as we take a closer look at what it’s all about with our 2017 BMW M4 Coupe review. BMW have their own M Division that built this car. Their weapon of choice this time around is a turbocharged 3.0-litre petrol engine. It delivers up to 444bhp if you add the Competitive Pack, and 424bhp without it. That’s enough to launch you from rest to 62mph in around 4.0 seconds flat. Go for the CS variant, and you get 454bhp, and can do 0-62 in 3.9 seconds before maxing out at 174mph. Despite all that power, the engine is composed in town and won’t scare old people with its soundtrack. And despite possessing such devilish straight-line performance, the M4 is just as fun on twisting roads. 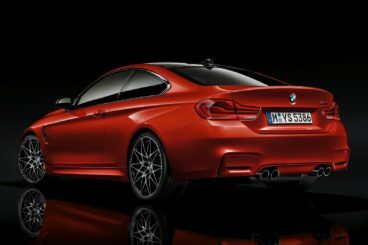 As well as making it lighter than before, BMW has modified its suspension and steering for more agility and versatility. As a result, it’s composed on the motorway, and a menace in the countryside. We mentioned earlier how awesome the automatic transmission is. It is a sweet one. But it’s not the only one available. Although it comes with a launch-control feature and lets you change how fast the gears shift, you might want the manual instead. It’s two-tenths of a second slower than the automatic, and comes without launch control. The GTS is the true firecracker of the range. It develops almost 500bhp, and does 0-62 in 3.8 seconds before maxing out at 190mph. It also feels lighter than before, and benefits from lightweight carbon fibre – something the standard model doesn’t have. It’s super accurate steering proves a massive attribute on the track. It offers plenty of grip, too, and feels composed at speed. From the outside, it’s hard to believe that this car would make a comfortable cruiser. But thanks to adjustable M sports suspension and comfy seats, it does. And this is great news because surely even enthusiasts don’t want to be zooming along at breakneck speeds all the time, right? …. right?? But while comfort is pretty much guaranteed inside the cabin, insulation isn’t. The tyres are high-performance, while the smallest alloys available are 19”. This means that on coarser surfaces, you might even struggle to hear your stereo above the din outside. Worse still (though some will get a kick out of it), the engine reverberates into the cabin via pipes. It sounds kinda cool, but it’s also clearly artificial. After the initial novelty has worn off, you might find that it gets on your nerves. 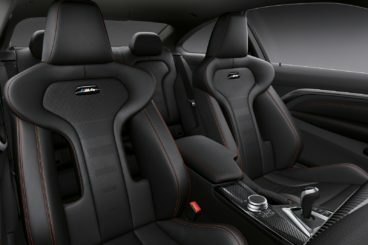 M Sport seats come as standard. They’re electronically adjustable and heated, and super supportive. The dashboard, meanwhile, is minimal but slick, and suits the austere character of the interior. All the controls are neatly presented, and everything is easy to find and use. The steering wheel gets the Alcantara treatment, as does the centre console. It’s all pretty stuff and you can see where your money goes. In terms of how practical the car is, it’s surprisingly useful. Especially compared to rival sports cars. It only has two doors, but interior space is still decent. The sloping roofline might cause a bit of ruckus in the back, but few will complain about the legroom. Moreover, the individual seats are comfy and supportive. The boot measures 445-litres, and it boasts a good shape. Standard kit – as expected – is good. For around £50,000 you get 19” alloys, Bluetooth, a DAB radio, heated seats and sat nav. Leather upholstery is also standard. As always with BMW, the list of optional extras is long. The Competition Pack adds 20” alloys and a sports exhaust for £3,000, while a rear parking camera would be a useful addition. A speed limit display is also available, though going for full leather upholstery will be pricey. The M4 Coupe has not yet been put through its paces by Euro NCAP, and we’re not sure if it ever will be. If it were, we reckon it would score 5/5 like its sibling the 3 Series Saloon. The usual safety kit is available, such as airbags and autonomous braking. Optional safety extras include the Dynamic Safety system, which shores up the security of the car if it suspects the driver is tired. Prices for the new car start out from £59,000 and rise to £130,000. For more information on our lease deals, you can check out our page here. In terms of its running costs, the addition of turbochargers may seem like a bad sign of the times for some of you. But they’ve hardly diluted performance. At the same time, they’ve boosted fuel efficiency. Combined with energy saving tech, they help the M4 Coupe return 32.1mpg and emit 204g/km of CO2. That results in a yearly £450 tax bill. However, those mpg figures are official ones only. In the real world, they’ll be hard to achieve. The car sits in insurance group 42, which makes it cheaper than most rivals to insure – including the Mercedes below. It’s BMW’s latest, and it shifts gear so smoothly. A 0-62 time of fewer than 4.0 seconds makes it the quickest out of the three cars in this review. It’s a cruiser on the motorway and a devil on bendy lanes. There’s plenty of fun to be had. Interior space is decent at best, but cramped at worst. We all love a fierce soundtrack. But the engine here grates after a while, especially when you just want to chill. Let’s see how the car fares against its rivals in the comparison section of our BMW M4 Coupe review. The new Lexus RC-F looks like a more menacing Audi TT. It offers excellent build quality, engaging handling, and comes packing a 5.0-litre V8 engine. That V8 engine is the only one available. It’s a firecracker that develops 471bhp, and can do 0-62 in 4.5 seconds. Despite all that ferocious power on tap, it’s easy enough to drive when you just want to cruise and chill. We like the fact that the engine emits a calm, quiet bassy hum at under 4,000rpm. Its murmurings are enough to get you giddy with anticipation. And when you break the seal and go beyond 4,000rpm, all hell breaks loose. It spits and roars like a fever. 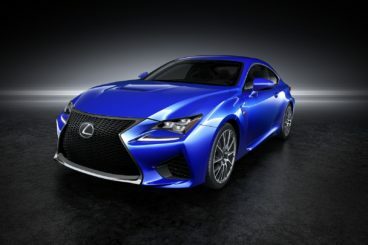 You could say, then, that the Lexus RC-F has a split personality. The downside to its Jekyll and Hyde nature is that you’ll need to work it hard in order to unleash its potential. With such an appetite for destruction, one can hardly expect the Lexus to be cheap to run. And although Lexus reckon you can return 26.2mpg, it’s more likely that you’ll be returning 18mpg at best. Meanwhile, it emits 252g/km of CO2, which means you’ll be paying £490 per year in tax. Depreciation is good, owing to the fact that it won’t have many owners. After three years, you can expect it to retain almost 50% of its original value. Step inside, and you’ll be welcomed by a gorgeous interior. Lexus has spared no expenses here, and the materials all feel top quality and robust. If you’re willing to splash out some more cash, you can get Alcantara-upholstered sports seats. The controls are neatly arranged, although some are poorly positioned and hard to reach. Another criticism is the touchpad you use to operate the infotainment system. It’s just not as user-friendly as the BMW’s. In terms of practicality, we doubt you’ll be expecting too much. Two upfront will be comfortable enough, but rear space is tight. And because there are only two doors, accessing those rear seats is tricky. The seats, however, are at least supportive and comfortable. The 366-litre boot is considerably smaller than the BMW’s, and the rear seats can’t be folded flat. The new Mercedes C43 Coupe is a beastly looking machine. But while it easily rivals the BMW in the bad body image department, it’s not as fun to drive. The M4 Coupe is the one for the purists. But that’s not to say that the AMG C43 won’t satisfy your desires if you thirst for extravagant performance. It has good straight-line speed, and can do 0-62 in just 4.7 seconds. That’s not as fast as the M4, and the C43 has less power. But if the M4 sounds a bit too scary, the C43 might be the better option. It’s good to drive, too, and comes with heavier steering than the standard C-Class saloon. There is a good amount of feedback too, and driver engagement is stellar. Add the Airmatic Agility package for a bit more cash and you benefit from adaptive dampers and air suspension. You also get Agility Select, which lets you choose your preferred driving mode. The C43 Coupe benefits from Mercedes’ brand new 9-speed automatic gearbox, which changes gear effortlessly. 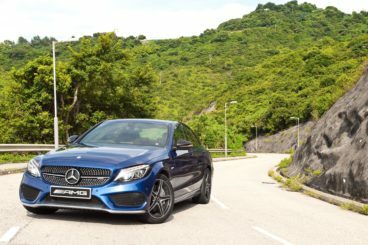 In terms of its running costs, the Mercedes C43 doesn’t fare too badly. It returns a decent 35.3mpg, and costs £230 a year to tax. However, those mpg figures are official ones only. In the real world, they might prove to be too tough to achieve. It’s unsurprisingly not a cheap car to insure either, and sits in group 45 out of 50. This means it’s more expensive to insure than the BMW. The interior is just as plush as anything inside the standard C-Class saloon. It’s well built, comfortable and smart. We like the pleasant detailing, as well as the top quality materials used for the dashboard. Sports seats come as standard, and they’re simple enough to adjust. Standard kit is good, and includes 18” alloys, black ash wood trim, a body kit, and lowered sports suspension. Without rear doors, the back seats are tricky to access. However, it’s still a very usable Coupe. There is plenty of room up front for driver and passenger, while the boot measures 400-litres. That’s not as big as the BMW, but it’s significantly bigger than the one in the Lexus. Rear seat room is a bit restricted thanks to the sloping roof, while knee room will be an issue for taller adults. If you want a fast car that’s engaging and desirable, you won’t go wrong with this one. Basically a new version of the M3, BMW have swapped a naturally aspirated V8 for turbochargers this time around. That’s caused an artificial engine noise that grates.